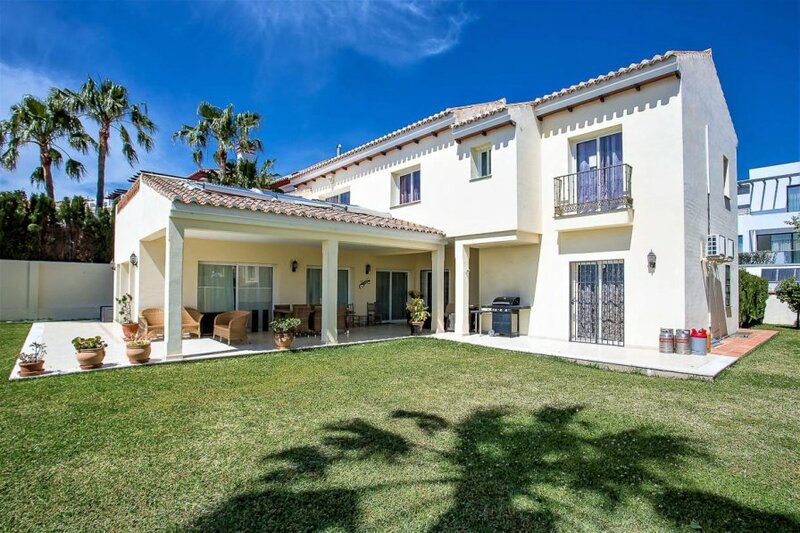 The villa is in a privileged location in La Cala de Mijas. The villa is south facing with a large pool and extensive gardens offering spectacular sea views. There are 4 bedrooms and the villa sleeps up to 9. The master suite has a large superking bed and ensuite bathroom. There are 2 more king size rooms and 1 twin room all with ensuite bathrooms. There is also a separate toilet. There is a foldaway bed which can be placed in the room of your choice. The spacious living room has comfortable seating areas and an open plan dining area view overlooks the gardens and the pool. The terrace is accessed from the dining area and has lots of comfortable seating areas and sunbeds you can choose sun or shade and some of the terrace is covered. Here you will find a bbq for your use for alfresco dining. The large pool is visible from all parts of the terrace and has plenty of space for swimming and games. The kitchen is fully fitted with all the necessary items for self catering. There is a fridge freezer, oven , hob , dishwasher and plenty of crockery , glassware and cutlery. There is a washing machine for your convenience and iron and ironing board. The villa is ideal for families as there is lots of outside space for play and sports. There is Wi-fi and Tv for your entertainment. For Breakfast you will find Snack Attack which also has an internet café and is very popular with locals and holiday makers and Bar Tuta is a popular evening venue for drinks. There are lots of restaurants to choose from. The Resort Office for the villa La Cala Blue can book excursions for you and arrange taxi transfers to and from the apartment. The villa is within walking distance to the shops and amenities in La Cala de Mijas, the village offers a wide selection of bars and restaurants and local shops. There are supermarkets and bakeries for fresh supplies for the fridge. There are several not to be missed places. The Little Geranium for a gastronomic experience, Venta Sorroche for cheap local fare and some great fish restaurants. Olivia´s and El Oceano for nightlife. There are frequent bus services to Marbella and Fuengirola and from there you can connect to Malaga, Seville and Madrid.